You know how many failed attempts I had at this Sugar Free Gummy Bear Recipe before I finally got it right? Ugh, too many! I started off using Knox gelatin because that was the only product I could find local to me. There’s not much gelatin in those little packs so I had a few fails because I didn’t add enough in each recipe I was creating. I ended up buying a big container of Great Lakes Unflavored Gelatin because it has excellent reviews. If you want to make Gummy bears, jello or anything that thickens, be sure you grab the orangish red label and not the green label. This is the exact Great Lakes Unflavored Gelatin I purchased on Amazon. I live in Austin and I could not find one local store that carries this high-quality gelatin in stock. Thank you AMAZON! I’ve been wanting to make homemade gummy bear treats for a long time. Most of the recipes out there insist you need real sugar to make them. I am not about to ruin my Ketogenic diet way of eating by consuming sugar. I’ve been sugar free for a year and 2 months now. Gosh, I feel like an addict on a 12 step recovery program. The Easter holiday is right around the corner so I am trying to think of fun sugar free treats that I can use to fill the Easter Baskets. Sometimes it seems impossible to make healthy options for our family but the effort is well worth the benefit and I am determined to be healthy! I spent a few hours in the kitchen last night making sugar free gummy bear treats and sugar free marshmallows. I am delighted with both! Stay tuned for a marshmallow recipe too. I am testing a few more things before I put that recipe up. I am hoping to make a chocolate covered Easter treat with them. I get so excited testing new techniques to fit my keto diet! 1/2 cup substitute powdered sweetener of your choice. We prefer using Swerve, Stevia or Erythritol. Add a few drops of Lorann oil extracts (I used about 3 droppers full) and a 1/2 teaspoon of vanilla extract. This part is where you can mix it to your liking. Personally, we like Watermelon, Strawberry and Pina Colada flavorings. We tend to use those often! I used the watermelon flavoring in this video I created showing you the process. Feel free to add food colorings at this step if you want to also. I use this Wilton Food Coloring set for occasions like this. Once I’ve added all the ingredients and mixed in thoroughly, I transfer the warm liquid into a measuring cup with a pourable spout. Have your silicone gummy bear mold sets out and ready for filling. There are so many different gummy bear mold sets that you are bound to find one or two you really like! You can get Lego sets, bear sets, worm sets, hearts and so many more! They are fairly inexpensive too! Next, use the eye droppers included in this kit to fill your silicone mold with the liquid mixture. TIP: Make sure to plan your mold on a baking sheet so that you can easily transport it to the refrigerator without spilling the mixture. Place the sets filled with the liquid mixture into the refrigerator for about 30 minutes or more for it to set. Remove the jellies from the molds and enjoy! This recipe filled about five small gummy bear trays! You can use any mold set you have. I used a chocolate silicone mold set too. I just made sure the liquid wasn’t really hot before adding the mixture to the silicone set. 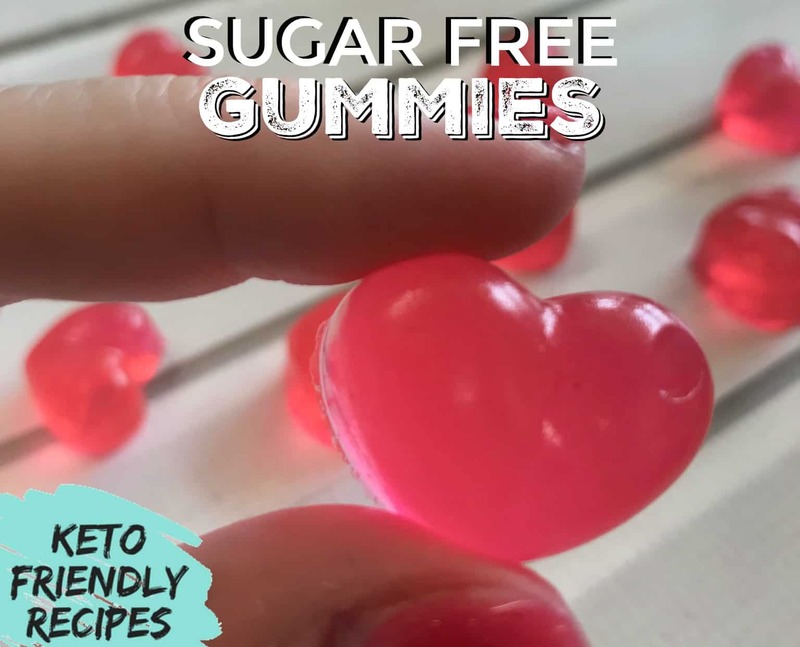 I think the next time I make this recipe I will do a large pan lined with parchment paper and let the kids do their own gummy bear cut outs with cookie cutters! I will be sure to make a thin layer of solution that sets in the fridge first. This would make an excellent kids activity! We didn’t eat all the gummies in one setting. I placed them in a storage container and kept them in the fridge. I did keep them out on the counter for about 4 hours and they didn’t melt or anything but I didn’t want them left out overnight. 1/2 cup substitute powdered sweetener of your choice. We prefer using Swerve Stevia or Erythritol. Once I've added all the ingredients and mixed in thoroughly, I transfer the warm liquid into a measuring cup with a pourable spout. Remove the jellies from the molds and enjoy! Don’t forget to pin this Sugar Free Gummy Bear Recipe on Pinterest for later! 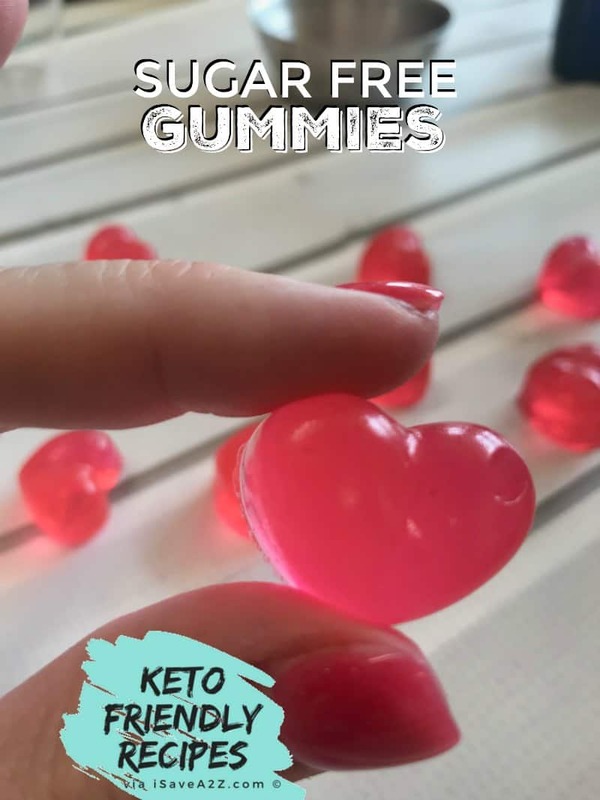 By Jennifer on March 16, 2018 Candy, Desserts, Keto Dessert Recipes, Keto Friendly Recipes, Low Carb Recipes, Recipes. Can I use coconut milk in this recipe to create a creamy flavored gummy? If so, how can i substitute using that? Do you this with the half cup microwaved liquid? Thank you! I am looking forward to trying these.